A delicious assortment of artisanal dark chocolates, made with 66% cocoa and without gluten or lactose. Baskets are also available in champagne-style sweets and candies Chocosina baskets are the perfect anniversary, corporate or thank you gift to please everyone and all occasions. 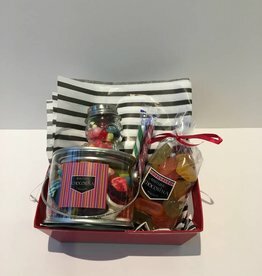 A sweet assortment of Chocosina's favorite candies; a 400g filled gummy mini-paint can from Spain; traditional wine gums from Holland; Jelly Bean Cub Mix and 2x Vintage Sticks from the U.S..
Silver gift basket filled with tuxedo silk paper and matching shredding. Black & white tuxedo stripe basket filled with matching silk paper and shredding.